A big part of the appeal of collecting comes with having a piece of your favorite athletes. In a sense, cards and memorabilia get you closer to these players. Autographs and game-used memorabilia cards take it a step further. These cards give collectors a chance to own something the player held or wore. In recent years, a technological advance has brought sports fans even closer to athletes: Twitter. Many players have embraced the social media site as a way of voicing their thoughts on everything from the night's game to what they had for dinner. Lots take it a step further, chatting with fans or answering questions. 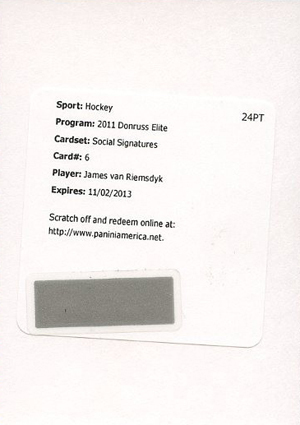 2011-12 Elite Hockey Social Signatures have bridged Twitter and card collecting. The ten-card autograph set focuses on the social media giant. 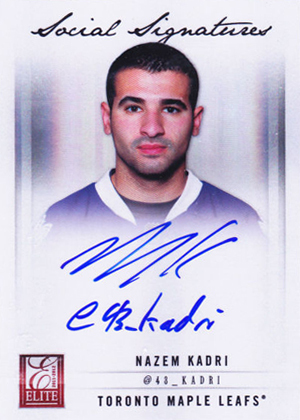 Most of the players inscribed their signatures to include their Twitter handle, which makes them unique from the majority of their other autograph cards. However, because some of the inscriptions are a little tricky to read, Panini also included the Twitter handles on the name plate as well. 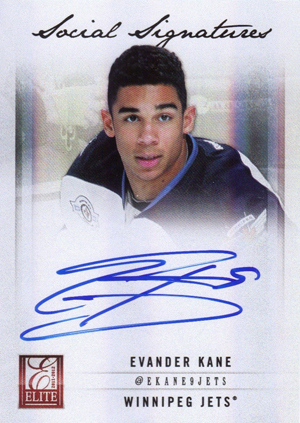 2011-12 Elite Hockey Social Signatures have on-card autographs. They're relatively tough to pull, falling just one per 12-box case. However, with a small checklist, most of the cards shouldn't be too tough to track down. 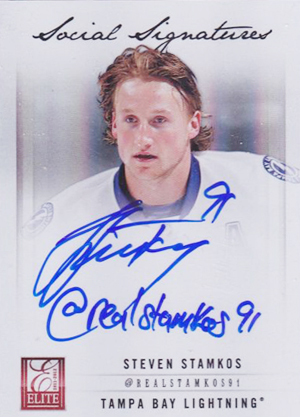 Steven Stamkos is a confirmed short print in the set. James Van Riemsdyk and Paul Bissonnette are both redemptions. The cards are commanding a solid premium over other autographs. 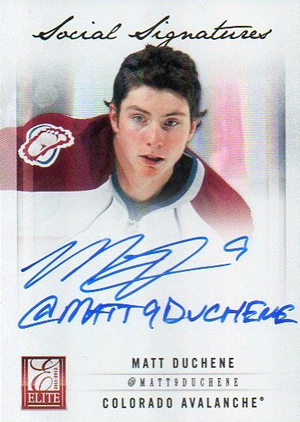 For example, the 2011-12 Elite Hockey Social Signatures Matt Duchene is selling for around $30 online. Duchene's Elite Signings card from the same set can be bought for half that. A 2011-12 Elite Hockey Elite Materials Autograph Matt Duchene, which comes with a jersey swatch and is serial numbered to 20, sold for $15.50. Both the Elite Materials and Elite Signings cards came with sticker autographs, which may help explain some of the price discrepancy. 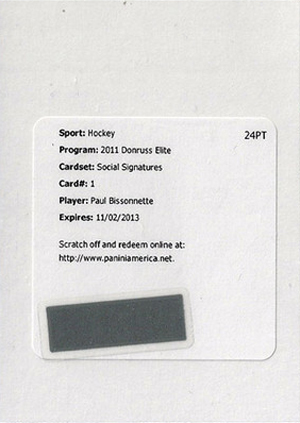 Hopefully Panini will carry the Social Signatures line to other sports. Who wouldn't love Twitter inscriptions from such high-profile users as Jose Canseco or Shaquille O'Neal? Don't be surprised, though, if Twitter handles become commonplace on more cards. 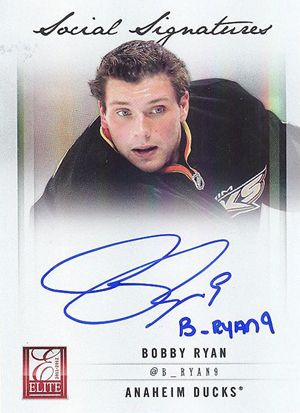 Not just as autograph inscriptions, but on the backs of cards as part of player bios. The platform has proven to be more than a passing fad. And with card companies constantly looking for ways to connect collectors with athletes, this could be a somewhat easy way of doing it. 2011 12 Donruss Elite Trading Cards NHL Hockey Hobby Sealed Box -FREE S H! AUTO?